This program is full. Please call 410-634-2847, ext. 0 to be added to the waiting list. Tuesdays, February 26 to April 30, 2019 10–11:15 a.m. Welcome spring with your preschooler at Adkins Arboretum! This series of ten classes is open to children ages 3 to 5. Classes include nature walks, stories, songs, snacks, and an art project to take home. 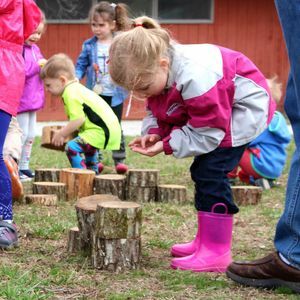 An instant play group for caregivers and tots alike, the nature preschool helps children learn socialization skills while they explore the wonders of the great outdoors. Nature ABCs, 123s, and nursery rhymes are part of the fun. Fee: $100 members/$125 non-members. A $10 sibling discount is available. Thanks to a generous grant by the PNC Foundation, fees are waived for Caroline County residents. Advance registration is required for all participants. How does ice form, and where does it go? Bring your mittens as we conduct an icy experiment, look for ice along the Blockston Branch, and make a sparkly icicle craft to take home. A special icicle-inspired snack and the beloved children's book A Snowy Day will cap off the morning. Learn how to tell a tree's age by examining its annual rings. Tree ring sleuths will make "tree cookie" necklaces, read tree stories, and explore the stumps at First Light Village. Let's get the dirt on soil! Budding scientists will observe soil samples with hand lenses, mix up gooey mud pies, and craft glittery "soil" shakers to remind us that there's more to dirt than meets the eye. What has eyes but can't see? A potato, of course! Let's learn about hte amazing spud, plant a potato bin in the Funshine Garden, and sing the Mashed Potato Anthem. We'll also use potato stamps to make fun artwork. Did you know that Astrodon is Maryland's state dinosaur? Travel back in time as we learn about the dinosaurs of North America. On a nature walk, we'll look for plants that grew during the age of the dinosaurs and investigate a trail of mysterious footprints along the way. Do you see pictures in the clouds? We'll learn to name the clouds, take a cloud walk along the Arboretum's meadow paths, and make fluffy cotton clouds to take home. A fun cloud song and a rainy-day symphony will round out the morning. Welcome to the wiggly world of worms! Did you know that worms are a gardener's best friend? Enjoy a walk to the Funshine Garden, where we will peek into a composting "worm hotel" and dig for worms in the soil. We'll also sing a "Wiggle and Waggle" song and snack on garden veggies. Help crack the mystery of the incredible egg! How are eggs formed? How do they hatch? Which animals lay eggs? Young nature detectives will conduct an eggs-periment, peek inside our bluebird boxes, and hunt for eggs in the meadow. No need to feel stuck in a bog! Spring is in full swing, and so are the Arboretum peepers! We'll stomp our feet to the "Pollywog Wiggle," make a frog craft, and use nets to scoop up tadpoles and other critters in the wetland. Let's take a walk to a sparkling stream and see what animals live there! If the weather's warm enough, we'll dip our toes in the water and race twigs under the bridge.